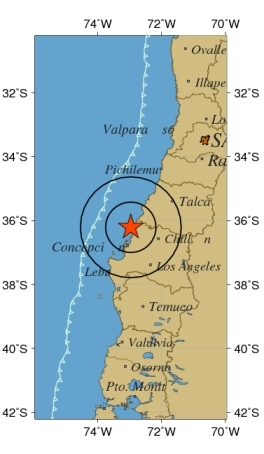 Today Saturday, 27 February 2010 at 3:34 am ET Chilean earthquake of 8.8 magnitude in Chile struck. The epicenter was located 325 kilometers southwest of Santiago (the capital of Chile – which also felt the earthquake and there have been massive damage -), 115 km from Concepcion, Chile’s second city, which has a population of 200 000 inhabitants, is a city that the majority of the population lives by the Bio Bio river and 96 miles from the ski resort of Chillan. After the earthquake, there have been 11 aftershocks of magnitudes higher, 6.0 degrees or more. A part of what has been the quake because of its great power, and the location of where the epicenter was there a tsunami warning. Already there has been a tsunami, the flooding of the ocean on the Juan Fernandez archipelago area especially in the Robinson Crusoe island, which reached up to half of the island, when in this area 3 missing. A tsunami warning is not only for Chile but also to Peru, Ecuador, and parts of Central America. The Tsunami Warning Center said Pacific Tsunami warnings were issued in 53 countries in South America, Hawaii, Australia and New Zealand, Japan, Philippines, Russia and many Pacific islands. Even in neighboring Argentina, where capital Buenos Aires, felt the quake, and more in nearby provinces such as Mendoza, bearing in mind that even this separating both countries, the Andes, has been said that there were some landslides of stones. The steeple of the church of Our Lady of Providencia in Santiago, Chile, collapsed, many buildings including hospitals have been affected. Until now, there are 122 death, it is expected that the number of deaths may increase due to the large number of wounded and that many passages between the collapsed freeways getting caught several cars and several people, to occur in the morning recently a few hours ago are looking great existing damage, and in lifting the existing debris begin to see dead people. It has declared a state of catastrophe in the 3 regions of Chile most affected by the quake, President Michelle Bachelet, asked all the population to remain calm and not leave, do not use cars if necessary, have the responsibility to know which currently have to avoid walking through disaster areas due to potential landslides and major aftershocks. God bless Chile and all the citizen and give them the force to face these situation.